"On Friday, January 27, 2012, the Village of Hanover Park held its annual Awards Night. Village President Rodney Craig, Village Clerk Eira Corral and Village Manager Ron Moser presented awards and recognized a host of Village volunteers and others who serve the Hanover Park community. 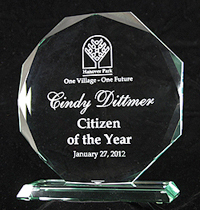 Mayor Craig announced Ms. Cindy Dittmer, founder of Back-Pack Buddies, as the 2011 Citizen of the Year. Back-Pack Buddies is an organization which supplies children in need with backpacks containing many basic care items, along with some comfort items." Backpack Buddies Club wins eTowns E-Chievement award! Our Backpack Buddies Club radio interview aired across North America on over 300 stations on 90.9 FM in the Chicago area, from Wednesday October 26th at 10:00pm to Tuesday October 23rd at 9:00pm! Many stations also stream over the web, so you can listen from their websites, anywhere in the world. We also podcast the show. Listen to the Backpack Buddies Club interview MP3 here! While you're there, feel free to take a look at our E-Chievement page. Note of Encouragement – must read! Years ago, a first grade class donated some backpacks with school supplies for our project. The neat thing they did was they pulled out their crayons and markers and wrote little notes of encouragement and put them in the backpacks along with the rest of the supplies. "Do good in school this year" or "Good Luck!" are examples of some of the words written on these cards by the young students. Have a beautiful school year. Study hard but take time to have fun with your friends also. Wow! Can you image if each of the over 7,000 backpacks we have already packed had a note like that in it? If you can help us with that goal of providing encouraging notes in future backpacks to spread hope to those that need to feel special, please let us know. I'd love each backpack to include that hope! Backpack Buddies Club is 10 years old, as of 2011! We want every homeless child to have his "own" backpack which can be his "home" away from home. Children are supplied with many basic care items, (school supplies, small toys, and toiletries), and some comfort items, (stuffed animals, pillows, and blankets). These items are things the children can be familiar with in a world that can sometimes be confusing and unfamiliar. Once a quarter, we drop off backpacks filled with various comfort and basic care items to food pantries and to local homeless shelters. These shelters provide many services to victims of domestic violence and their family members. Another way we help is by going to nursing homes and having the residents there help us sew small, comfy pillows to be put in the backpacks. It is wonderful to see both the young and the old working together to help children in need. We started out as two sisters who were looking for a service project for our children. We wanted our kids to learn how to work and how to serve other people. This project gives our kids a chance to experience the gift of giving. It also is an attitude-shift on their part from concern about themselves to concern for others. We decided to help local homeless children and children in need. Currently we are delivering filled backpacks quarterly to homeless shelters, churches, and food pantries. The Daily Herald, USA Weekend, and the Points of Light Foundation awarded us local winners of "making a difference" on Make a Difference Day 2001. A check for $500.00 was awarded to the charity of our choice, The Elgin Community Crisis Center. The idea has caught on. We are now being helped by other moms, their kids, community members, churches, schools, and other organizations. Since our first delivery in October 2001, we have delivered over 7,200 backpacks! We are continuing to grow and now have become a 501(c)(3) Corporation.